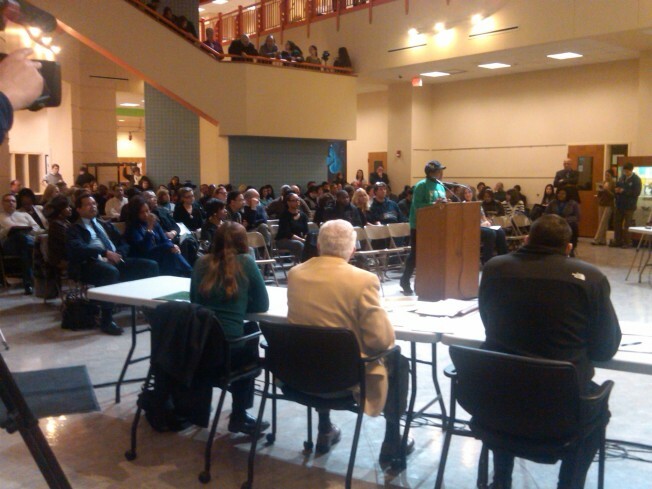 Students Will Perform Play With "N-Word"
Packed house at Board of Ed Meeting to decide the fate of controversial play. A controversial play that uses the “N-word” will go on in Waterbury. Last month, Supt. Dr. David Snead opposed the Waterbury Arts Magnet School performance of August Wilson’s play, ‘Joe Turner’s Come and Gone’ because of the derogatory term. He said the N-word should never be used because it’s highly offensive. But students who attended a hearing on Wednesday night said they are mature enough to understand the context in which the word is being used. “I don't support the use of the N-word in a derogatory way but I stand behind this play 100 percent because it's a time for youth to be educated,” student-actor Michelle Saunders said. After listening to dozens of students for more than two and half hours at Wednesday night’s school board meeting, the board and Supt. Snead reached a compromise that would allow the play to go on, as long as educational discussions are held before and after they watch the play. “This production's purpose is not promote slavery or the N-word but to tell someone's story,” student-actor Ben Orlando said. Some parents and community members did speak out in opposition to the students performing the play and said any use of the N-word is inappropriate. But students don’t want the attention the story has gotten to keep people from going to see the play. “Please don't let the fear of the audience's reaction stop us from doing the play,” student-actor Valerie Henry said. The production is scheduled for next month.